Out of all of the My Little Box's I've had so far, this one is definitely up there with the best. If you know me, you'll know baking is my thing and when I unwrapped My Little Sweet box I was so excited! Firstly instead of just a cardboard box this months was in a gorgeous tin worth £7.50, which I'll definitely be using to keep my baking bits and pieces in! I absolutely love the little illustrations. 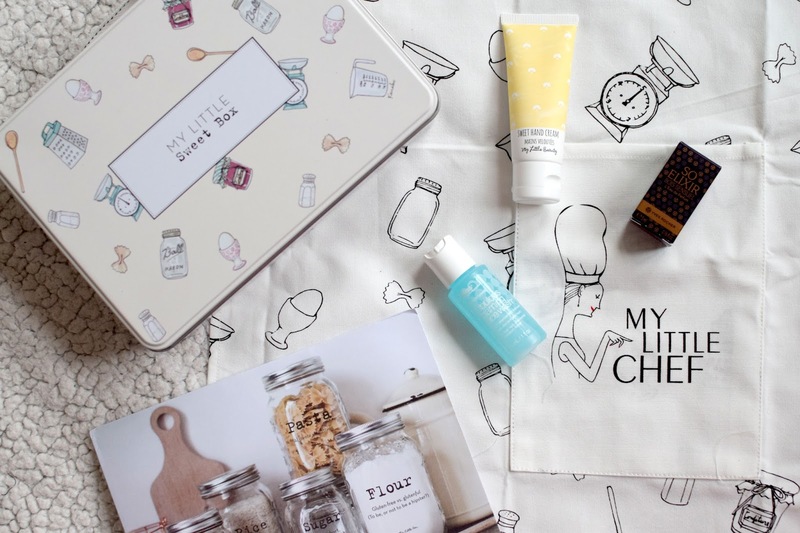 I'll start with the lifestyle stuff, my favourite part of this box has to be the Apron worth £11! I'd actually asked for a new apron for Christmas but when I saw this I told my mam she needn't bother, I love it! It's one that ties around the waist and has a little pocket on the front which is super handy. I love the My Little Chef design and the same gorgeous illustrations. There was also a pack of Jar Decals worth £3. Again I think these are really handy and we don't have any labels on our jars at the moment. I loved the way they came in a little envelope. Onto beauty bits there was a a delicious little Sweet Hand Cream from my little beauty. This cream is super thick and marshmallow scented, amazing for Winter! There was also a Bliss Fabulous Foaming Face Wash, £17.50 for 197ml. I've never tried anything from Bliss but I think this sounds really nice. It purifies, cleanses and exfoliates with botanicals including Passion Flower and Rosehip. Finally there was also a Yves Rocher So Elixir Bois Sensuel Fragrance, £52 for 50ml. Again I've never used anteing by Yves Rocher. The fragrance is described at feminine with vanilla and patchouli, with woody and rich aromas.